The renewal of Christchurch, New Zealand after a devastating earthquake just took a huge leap with the opening of a pedestrian shopping mall made from shipping containers. The brightly colored stacked boxes hold 27 stores as part of the City Mall Re:START project. Thousands of visitors flocked to the temporary mall’s opening the first weekend to enjoy the café, the large pedestrian area and two horse-shoe shaped pavilions. The mall offers a bit of normalcy to the residents, and some serious contemporary eco-style. The project is one of many shipping container designs we have seen, but this particular design has come under fire by another group for breach of intellectual property rights. The group is currently using every means to either get a licensing agreement or shut it down. Christchurch has lost a lot of it infrastructure, in addition to 166 lives lost in the February 22nd earthquake. The town was looking for novel designs to help the city bounce back, similar to that of Shigura Ban’s Cardboard Cathedral. The shipping container mall is one of the most striking features of the cities renewal. Most of the stores are locally owned and have been a part of the community for years. The development took only months to put together, but still has a level of thoughtful design, as well as bright open spaces with interesting gathering areas to linger on a warm spring weekend. The Mall is expected to stay intact for a least a year until the downtown pedestrian mall areas can be restored. Its hard not to think that the Boxpark developer who is touting the “world’s first pop up mall” is barking up the wrong tree. We have seen many retail spaces in shipping containers, like the Puma City Store, the Brooklyn Shipping Container Market, and this Sao Paulo Furniture store, to name just a few. To make a stink about a community who went through such a tragedy seems foolish and does not serve the architecture and development profession well. I thought the purpose of creating great design ideas was to contribute to the world and help to improve it somehow? Clearly these days it's all about accolades, big bucks and preening those inflated egos, it's just a sign that certain members of the human race weren't given enough positive affirmation as children - get over yourselves Londoners and get some perspective. thet need to get over themselves and move on as this is a city in deep crap and all they want is to make money outa it!! leave Christchurch alone and go pick on something else you lot of greedy selfish people involved in this lawsuit. there is no need for it, seeming others have done it before Christchurch did and you did nothing!! 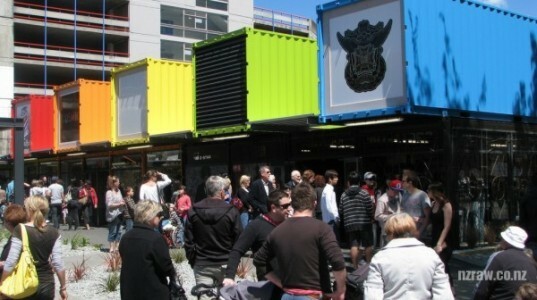 The renewal of Christchurch, New Zealand after a devastating earthquake just took a huge leap with the opening of a pedestrian shopping mall made from shipping containers. The brightly colored stacked boxes hold 27 stores as part of the City Mall Re:START project. Thousands of visitors flocked to the temporary mall's opening the first weekend to enjoy the café, the large pedestrian area and two horse-shoe shaped pavilions. The mall offers a bit of normalcy to the residents, and some serious contemporary eco-style. The project is one of many shipping container designs we have seen, but this particular design has come under fire by another group for breach of intellectual property rights. The group is currently using every means to either get a licensing agreement or shut it down.